Samsung HW-M360: Is this wireless soundbar deal any good? | What Hi-Fi? Samsung HW-M360: Is this wireless soundbar deal any good? If there's one thing we can all agree on, and sometimes in the world of consumer technology it feels like there's only one thing, it's that the vast majority of TVs deliver pretty poor quality sound. It doesn't matter what you're watching, low-quality audio can have an adverse effect on your TV experience, whether it's being unable to hear dialogue, remaining unimpressed by crashing action scenes or feeling detached from what should be an immersive moment. That's where the Samsung HW-M360 could help. Soundbars and soundbases remain the most cost-effective upgrade you can give your TV's sonic side and this Samsung soundbar is one of the best-selling models on the market. But is the Samsung HW-M360 any good? Should you be spending your hard-earned money on it? And if not, what's the best alternative? The short answer: The Samsung HW-M360 offers a lot of technology for the money. There's a wireless subwoofer, plus wireless Bluetooth connectivity on the soundbar itself (for connecting to your TV and for streaming music from your phone, tablet or computer). There's also the option to add surround sound speakers for a more room-filling sound. Our previous tests of Samsung soundbars has found good value, four-star soundbars, more than capable of upgrading your TV experience. So for this price, we think you're on pretty solid ground with the HW-M360. Considering how cheap this Samsung wireless soundbar is, you get plenty for your money. For a start, there's the wireless functionality. This works in two ways. The Bluetooth connectivity not only allows you to connect to compatible TVs without using a wire, but also allows you to connect to phones, tablets or computers in order to stream music straight from your device. Neat. What's more, it comes with a wireless subwoofer (there's a theme here, clearly). The M360 is also 'wireless surround sound ready' so it can be upgraded to a surround system with the addition of the SWA-8500S wireless rear speakers. But out of the box it's a 2.1-channel system. The subwoofer is a bass reflex design, which means there's a port (hole) in the cabinet that aims to improve the sound. The system claims a 200W power output, too. When it comes to control, if you've got a Samsung TV you should be able to control this soundbar with your existing remote, which is a handy feature. For everyone else, as well as the supplied remote controller you can use the Samsung Audio Remote App on your Android smartphone or tablet to control all the key soundbar functions. Due to the price, further features and specs are limited. So there's no Dolby Digital support, and DTS audio is only supported in two-channel audio. You do get five DSP sound modes, however, for tweaking the pseudo-surround sound effect to your liking. There are optical and analogue audio inputs, but no HDMI. As a result, it can't pass through 4K or HDR video, so you would need to connect straight from a Blu-ray player to your TV. 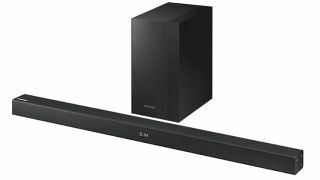 Measuring approximately 91cm across, it's a particularly wide soundbar but its other dimensions are relatively compact. The sub measures 17.9 x 35.3 x 30cm. Other options from Samsung include the Samsung HW-M460 (£159), which ups the power to 320W per channel, but otherwise retains many of the same features as the 360. There's also the Samsung HW-MS650 (£299), a 'wireless smart soundbar' featuring nine integrated speakers and 4K video pass-through support. We have reviewed three Samsung soundbars over the last few years. The Samsung HW-N950 is a more premium offering – and more of a sound system than a soundbar. There are 18 speakers in total across the multi-box package, comprising a soundbar (with six drivers and three tweeters along the front, a side-firing speaker at each end, and two upfiring speakers); a wireless subwoofer (20cm bass unit); and two rear wireless modules (each with an upward-firing and front-facing speaker). This is is no small part due to the inclusion of Dolby Atmos processing, which helps deliver a big, all-encompassing, surround sound experience. The N950 has HDMI inputs, plenty of power and wireless streaming, too. The Samsung HW-K850 wasn't quite as successful. Also a Dolby Atmos soundbar, this more affordable TV speaker system delivered deep bass and an expansive sound but we found it a little lacking in excitement and subtlety. You do get a good feature spec, however, with a wireless subwoofer, HDMI input, Spotify Connect and wireless streaming. The Samsung HW-MS750 is in the same range as the Samsung HW-M360 but offers a little more for a higher price, though it doesn't come with a wireless subwoofer or any Dolby Atmos support. The main feature upgrade is HDMI connections, the 750 offering HDMI sockets and optical and 3.5mm inputs, 4K and HDR passthrough, Bluetooth and wi-fi. It delivers a large, spacious, balanced sound with good detail and dynamics, plus the option to add a subwoofer or rear speakers. If you don't want a sub, this could be the best premium Samsung soundbar for you. Not convinced by any of the Samsung soundbars? These are the pick of the best other options on the market, regardless of brand. The very best soundbars can pack great, meaty sound into a package small enough to sit in front of your TV. They can also boast wireless subwoofers, Bluetooth, 4K-friendly HDMI inputs and even Dolby Atmos audio. A solid, affordable upgrade to your TV speakers. Another five-star soundbar from Yamaha's impressive stable. Small, adaptable and – most crucially – great-sounding, the Beam could be Sonos's best product so far. Another Yamaha soundbar that does a very convincing job of immersing you in movie soundtracks. A massive success in a gorgeous package. This Sony takes the Dolby Atmos soundbars to new heights.